After visiting with Zoe last night, I wasn’t quite sure what I wanted to do. 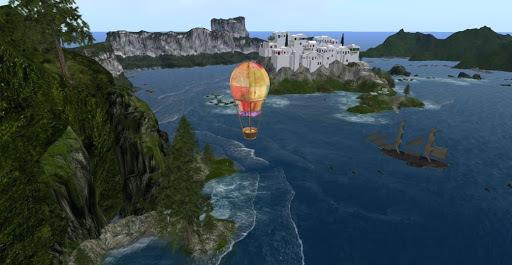 I’ve been trying to stay away for my newly discovered gem, Calas, but I had seen the free balloon ride near the entrance and since there were still many places I hadn’t seen yet I decided that a balloon ride would be a great way to just ease into the night. 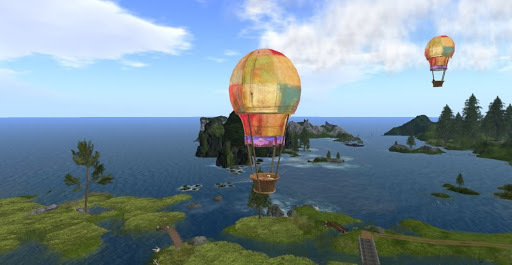 As my balloon lifted above Calas, I saw another balloon being readied. I drifted across marshes and wetlands and if you look in the distance there was another balloonist a mile or so ahead. It was nice to see the great islands I had seen from the mainland. You could see mountains surrounding a great bay with water pushing thru the channels. My balloon drifted across the top of the great forest on the edge of the Misty Mountains. The balloon ride carried me thru all eight sims and lasted almost an hour. It was a wonderful way to become familiar with this enormous region of the world, and I recommend it to everyone. Unfortunately, as I drifted above the great beauty, I felt myself slowing down. Instead of running away from my recent nightmares, I was sort of jogging along. And some unwelcome feelings flutter around in my mind. It is hard to discard feelings regardless of how hard you try; it just takes time. I tried to start some conversations with a guy I know, but I think he has moved on into a new community. I tried another guy and he assured me that our relationship was not a “relationship” because that isn’t part of his second life (geezus, that was helpful). I looked for my vampire friend, but he wasn’t around. So, I just stopped looking for anyone. Last night had come and brought some melancholy, but it was more of the pensive and thoughtful kind. Like with real life, some nights are just not worth the time they take to pass. Otoh, my trip to Zoe’s world in Caledon filled my mind with new possibilities. For one thing, I’ve been looking for something in the vastness of Caledon that I could look at and say, ah! I get what’s going on here. Even though Caledon is on my Wonders of Second Life list, I have barely scratched the surface of it. This is the kind of challenge that brightens my thoughts for the coming days. This entry was posted in Exploring and tagged Beautiful Regions, Exploring, Photography, Second Life, Treasures. Bookmark the permalink. Very cool! Keep looking & keep sampling. I would offer this as perspective: Don't take it too seriously! Let it be a fun thing. The type of character I enjoy being in a Steampunk setting is a "Mad Scientist." hehe I don't go for all the Victorian folderol very much but I sure love wacky & zany machines & contraptions!